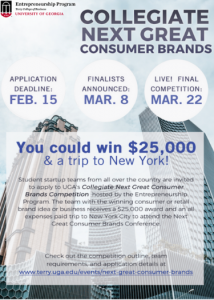 UGA’s Next Top Entrepreneur and Collegiate Next Great Consumer Brands. No matter what stage of the business a team may be in, pre-revenue or established, all are encouraged to apply! The competitions invite people to participate from all over the country and in years past we have had winners from Babson University in Boston to Australian exchange students from our own Terry college. Below we have provided graphics and social media blurbs that we request you pass along via newsletters and your personal social media accounts. Contact kdfrank@uga.edu for any further questions.